At this point the River Doe has carved a deep narrow gorge into the rock, believed to be 60ft down. There are a number of twists and turns and plenty of opportunities to overlook the spectacular sight both below and around you. There are several falls within this section as the river plunges down through, but they do not appear to have names. At one point there is a viewing platform across the gorge, giving a good view of the river a long way down below. 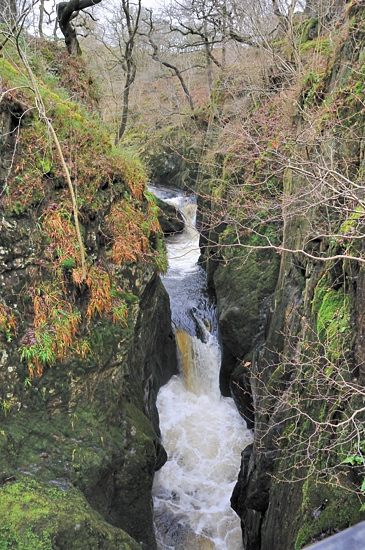 Eventually the gorge opens out into the first of a number of rocky areas. There is a steep set of steps down to this area, the wooden path is surrounded by mini waterfalls coming off the hillside around. The river runs on through and some people picnic on the limestone rock bed amongst the small rock pools of water, and you can, if it's not covered in water and you can figure out how to get down there. This waterfall is one of a number located on the Ingleton Waterfalls Trail access is available from this trail which is open to the public (with charges), see the walks location guide for common details. Waterfall on trail before is Rival Falls going clockwise. Waterfall after is Snow Falls on the River Doe.